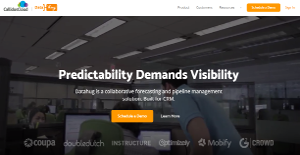 Datahug delivers an integrates solution that combines collaborative forecasting and pipeline management into unified platform with big emphasis on collaboration. The software is designed to provide sales managers deep visibility into the sales pipeline and at the same time, significantly lighten the burden on salespeople to update CRM. With Datahug, you are aware of all the movements in your pipeline. This helps you empower teams to be responsible and involved in the forecast. As you gain visibility into every deal and their respective progress, you are able to make the necessary changes and adjustments to shorten sales cycles and improve your win rates significantly. DataHug provides total pipeline visibility to executives, sales managers, and salespeople. All deals and their progress can easily be seen, which allows users to make very accurate forecasts, devise and executive effective plans of action to ensure the success of every deal. As DataHug is built on Salesforce, it is quite easy for users to capture the forecasts of both representatives and managers and create viable predictions based on reliable and actionable data. The system also lets you access your forecast history and see how your predictions fared throughout the quarter. No more need for spreadsheets as forecasting becomes more and more visual. This also means that you can connect Datahug to your company’s email and calendar application. The members of your sales teams are always at the front and their performance needs to be stellar every single time. DataHug can be used to evaluate their performance. Based on reliable, actionable data, sales managers are able to come up with constructive feedback on how to reduce sales cycles and further improve their win rates. The Datahug system has proven to deliver top grade transparency for any sales organization and helped companies figure out prospect’s interests and determine how their reps should react. Every company is different, and might call for a particular type of Sales Management Software solution that will be fit for their company size, type of clients and employees and even specific niche they support. You should not count on getting an ideal services that is going to be suitable for each company regardless of their background is. It may be a good idea to read a few Datahug reviews first and even then you should keep in mind what the solution is supposed to do for your company and your staff. Do you need a simple and intuitive service with only elementary features? Will you actually make use of the complex tools needed by experts and big enterprises? Are there any particular tools that are especially practical for the industry you work in? If you ask yourself these questions it is going to be much easier to find a trustworthy solution that will fit your budget. How Much Does Datahug Cost? We realize that when you make a decision to buy Sales Software it’s important not only to see how experts evaluate it in their reviews, but also to find out if the real people and companies that buy it are actually satisfied with the product. That’s why we’ve created our behavior-based Customer Satisfaction Algorithm™ that gathers customer reviews, comments and Datahug reviews across a wide range of social media sites. The data is then presented in an easy to digest form showing how many people had positive and negative experience with Datahug. With that information at hand you should be equipped to make an informed buying decision that you won’t regret. It answered our forecasting and visibility problems. Gives clear visbility without affecting overall performance. A recommended approach for gaining insight on an opportunity or what's currently going on with an account.. Meaningful data in a timely way without doing things manually. What are Datahug pricing details? What integrations are available for Datahug? Pros: This platform was able to resolve one of many problems found in a sales organization: pipeline visbility. Datahug's team is really great collaborating with. They're constantly telling us on any upcoming events/scenarios. They listen intently to feedback from customers. Its latest forecasting feature is able to address another pain point seen in sales organization. Cons: Its functionality has some restrictions when the product was initially released. Since that happened, they've been answering to feedbacks to ensure that what we envisioned would actually come out at the time of purchase. One thing that I'd be hoping for is giving room for weekly forecasting. But I have a good feeling, it'll come out sometime soon. Pros: There are so many things to appreciate with Datahug. It does its job in keeping you abreast of your pipeline. I felt it's useful for those who are involved in intricate and extensive sales cycles; this software got great tools for forecasting to go with their communication tracking. In my personal opinion, it's a handy feature since it's able to pick up and recommend contacts on opportunities (according to the domain name and communication velocity). I hate having to include contacts to SFDS, but now, it's a 1-2 click process. Cons: Collaborating with a consultant across apps tend to be confusing at times. There aren't any options in adding a second/third domain in tracking within out SFDC instance. But then again, this may be an implementation matter occurring on our side. The best sales enabling tool for us. It offers a wide range of analysis opportunities. It's forecasting feature is valuable! If you need more information about Datahug or you simply have a question let us know what you need and we’ll forward your request directly to the vendor.